Beetle follows Carabidae family, and Coleoptera order. 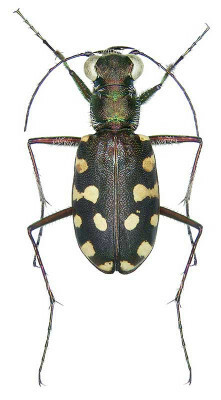 Size is between 12-15 mm, colour is brassy bronze with white spots mostly connected to each others. Adults are diurnal and very active, whereas larvas live in holes. Adults and larvas are predators to smaller invertebrates and plays important role in biological insects' control.